In this study, a nonlinear multigrid method is applied for solving the system of incompressible poroelasticity equations considering nonlinear hydraulic conductivity. For the unsteady problem, an additional artificial term is utilized to stabilize the solutions when the equations are discretized on collocated grids. We employ two nonlinear multigrid methods, i.e. the “full approximation scheme” and “Newton multigrid” for solving the corresponding system of equations arising after discretization. 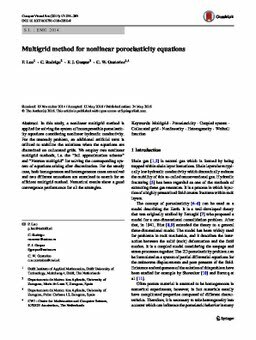 For the steady case, both homogeneous and heterogeneous cases are solved and two different smoothers are examined to search for an efficient multigrid method. Numerical results show a good convergence performance for all the strategies.